Maine Central Institute head coach Tom Bertrand gives instructions to his team during their football practice in Pittsfield in this Aug. 18, 2018, file photo. The 2017 season seemed like a typical transition time for the Maine Central Institute football team. Elevated a class by enrollment after winning three consecutive LTC titles and scoring a stunning last-second victory in the 2016 Class D state championship game, the Huskies were experiencing growing pains in Class C North last fall. A 2-3 start left little margin for error late in the regular season. But not only did coach Tom Bertrand’s club win two of its past three regular-season contests, the Huskies won four straight postseason games away from home to repeat as state champions. It’s such perseverance that leaves Pittsfield-based MCI as one of the teams to beat again this year. The battle for the top spot in Class C North, also known as the Big 11, is expected to feature a blend of traditional powers and emerging threats. 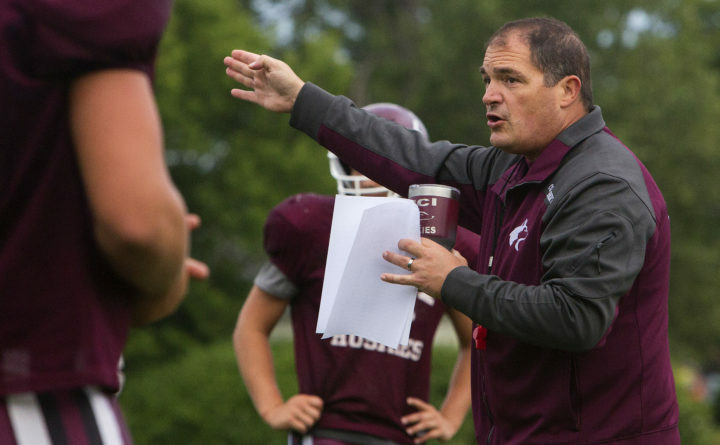 MCI and Winslow are the more established programs among the elite, while Hermon and Nokomis of Newport look to settle in at the top level after each posted a 6-2 regular-season record under a first-year head coach last fall. MCI is led by senior Seth Bussell, a nose guard who is likely to see plenty of his offensive work at running back. Sophomore Ryan Friend is back for his second year as the starting quarterback, while T.J. Kuespert, Andrew Whitaker, Will Russell, Tyler Staples, Kempton Roy, Cole Steeves and Elijah Bagley are expected to be significant contributors. Hermon and Nokomis also boasts multiple scoring threats, but both offenses begin with experienced quarterback play. Hermon senior Garrett Trask was first-team, all-conference at both quarterback and defensive back last fall. The Hawks also feature wideout Keith Pomeroy and running back River Mullen along with a veteran front line and two impact transfers in lineman Deakin Dow from Hampden and wideout/defensive back Travis Spell from Old Town. Nokomis, coming off the first winning season in program history after back-to-back winless campaigns as a Class B program in 2015 and 2016, boasts a 33-player roster that includes 13 seniors and 10 juniors. Andrew Haining is a fourth-year starter at quarterback who also earned first-team, all-conference honors at defensive back for coach Jake Rogers’ team last fall. Another returning 2017 Big 11 first-team, all-star for the Warriors is senior linebacker Quinton Richards, while senior wide receiver Brock Graves and senior running back Alex Costedio are among other playmakers. Winslow must overcome having only four seniors on its 37-player roster, but longtime coach Mike Siviski’s squad boasts 11 players from each of the three other classes and generations of tradition to draw upon as the Black Raiders seek their first regional crown since 2015. Mount Desert Island, a regional champion in 2016 and runner-up last fall, welcomes longtime assistant Mark Arnold as its new head coach. Arnold, who replaces the retired Mark Shields, will rely on returning experience along the line of scrimmage and the big-play potential of running back Elijah Joyce to help keep the Trojans in contention for postseason play. Arnold is one of two new coaches in the division along with Gregg Bouchard at Belfast. Oceanside of Rockland, a regional semifinalist in 2017, returns a 1,000-yard rusher in Ben Ripley. He will team in the backfield with Zach Cody while senior captain Sebastian Sanfillipo anchors the Mariners along the line. Medomak Valley of Waldoboro narrowly missed out on a playoff berth during its first year of eligibility in Class C last fall. Coach Ryan Snell’s Panthers hope to take that next step with a roster led by senior QB/LB Eli Miller, senior WR/DB Brian Pollard, junior two-way tackle Erik Bennett and junior TB/LB Drew Severson. Playoff entry John Bapst of Bangor went 3-5 during the regular season, but three of its losses were by a combined 13 points. Coach Dan O’Connell’s Crusaders return just five seniors in HB/DL Jared Smith, FB/OLB Reed Kiah, S/FB Nick Brown, OG/DT Logan Eckman and OL/MLB Noah Scanlan, but the team also has an experienced junior class. Old Town, which had two of its top players from a year ago transfer in Spell and Ethan Hayes (Brewer), and Belfast both are rebuilding after finishing 2-6 and 0-8 respectively last fall.